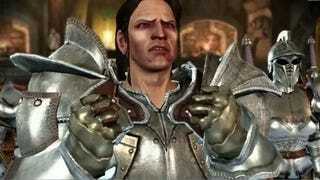 Some gameplay in this latest trailer for Dragon Age: Origins. Seriously, you didn't expect that statesmanlike speech to quell the bloodthirsty citizens of Denerim, did you? Not when everyone carries huge swords and wears huger shouldermopads during an ordinary day.